Which illnesses or injuries are treatable? Since temperament testing is so unreliable, how can shelters protect both dogs and people? How can shelter staff feel confident they are doing everything possible for every single animal every single time? The No Kill Advocacy Center has developed a model animal evaluation matrix to help shelters answer those questions (and for rescuers and advocates to hold them accountable if they don't). 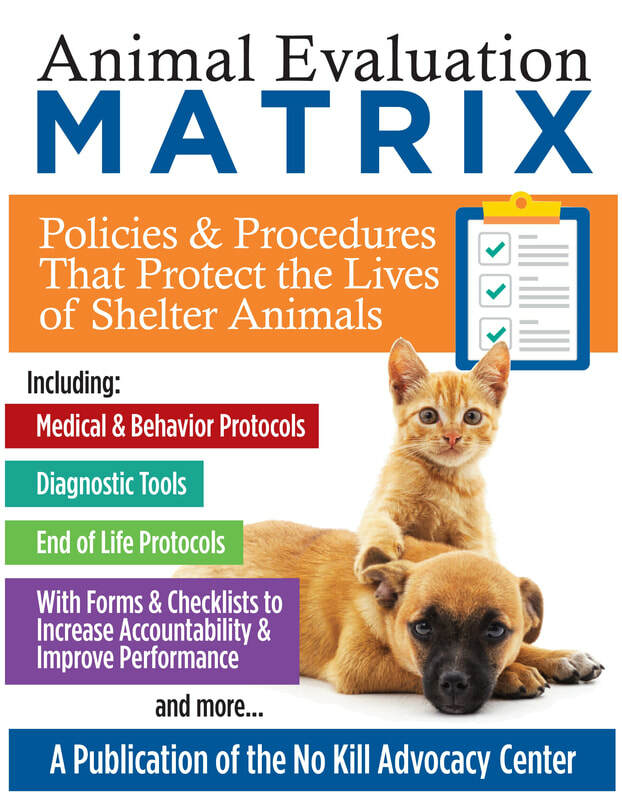 Our "Animal Evaluation Matrix: Policies & Procedures That Protect the Lives of Shelter Animals" includes medical and behavior protocols, diagnostic tools, end of life protocols, with forms and checklists to increase accountability and improve performance, and more. These protocols were developed in collaboration with some of the most successful shelter directors in the country; directors running municipal and animal control-contracted shelters with live release rates of 97% - 99%. By following the protocols, shelters with live release rates above 95% have reported even higher ones as a result. Those below 90% will see even more dramatic lifesaving increases. While we encourage all shelters to fully implement them, shelters can also evaluate them on a pilot project basis.